The 2011-2012 SolidWorks Student Edition is available now! In all seriousness, the 2011-2012 SolidWorks Student Edition is now available. 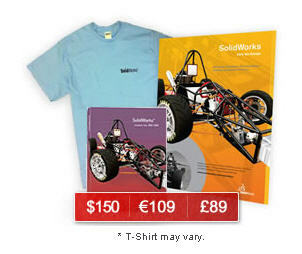 For $150/€109/£89 you get a 12-month license of SolidWorks Premium, which includes eDrawings, SolidWorks Simulation Premium and SolidWorks Sustainability, as well as a SolidWorks t-shirt and poster. Disclaimer: The SolidWorks® Student Edition is available to high school and degree-seeking students or full-time faculty members using the software for personal learning or academic purposes. Proof of eligibility is required before you can complete your order.